Students should examine cultures in containers, which have been taped and closed. Colony morphology is a method that scientists use to describe the characteristics of an individual colony of fungi growing on agar in a Petri dish. It can be used to help to identify them. Plate 1 contains a circular piece of bread that has been allowed to go mouldy. 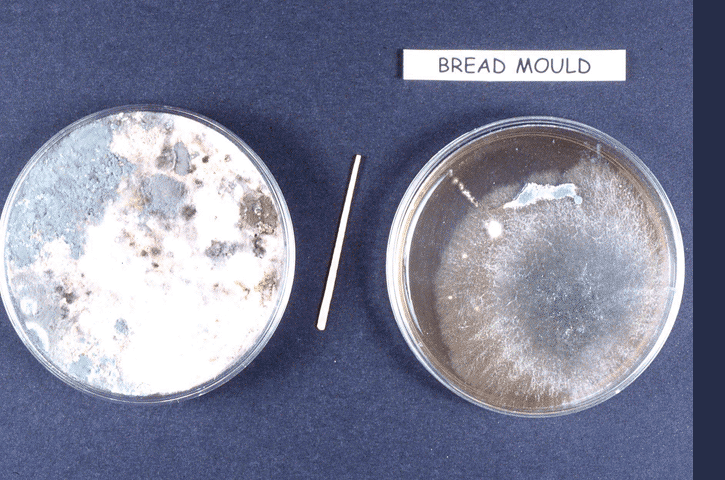 There is overgrowth on the plate and many different mould species can be seen. In between the two plates is a toothpick which was used to isolate the spores from one of the moulds from plate 1. The mould spores from the toothpick were inoculated onto malt extract agar, plate 2. Use the diagrams on colony morphology to help you interpret plate 2. Two malt extract agar plates were exposed to the air outdoors and two malt extract plates were exposed to the air indoors. Use the diagrams on colony morphology to help you interpret the plates. 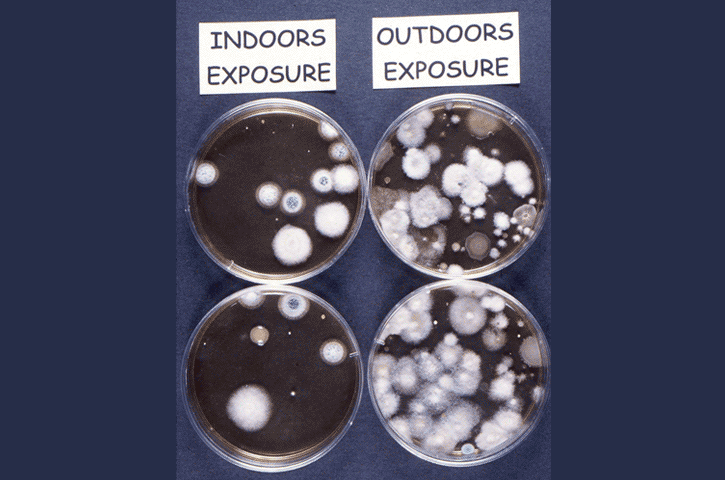 Why do you think there are more moulds on the plates exposed to the outdoor air than the indoor air? An excellent example of fungal mycelium. Use the diagrams on colony morphology to help you interpret the plate. Form - What is the basic shape of the colony? 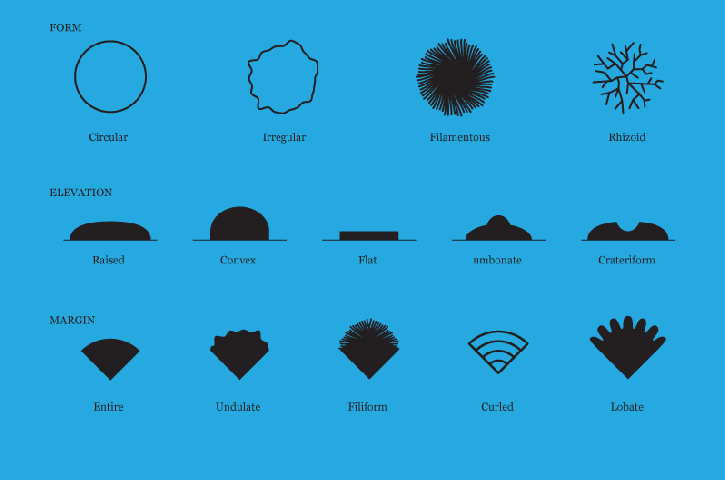 For example, circular, filamentous, etc. Elevation - This describes the side view of a colony. Turn the Petri dish on end. Margin/border – The edge of a colony. What is the magnified shape of the edge of the colony? Surface - How does the surface of the colony appear? For example, smooth, glistening, rough, wrinkled, or dull. Opacity - For example, transparent (clear), opaque, translucent (like looking through frosted glass), etc. Colour - (pigmentation) - For example, white, buff, red, purple, etc. 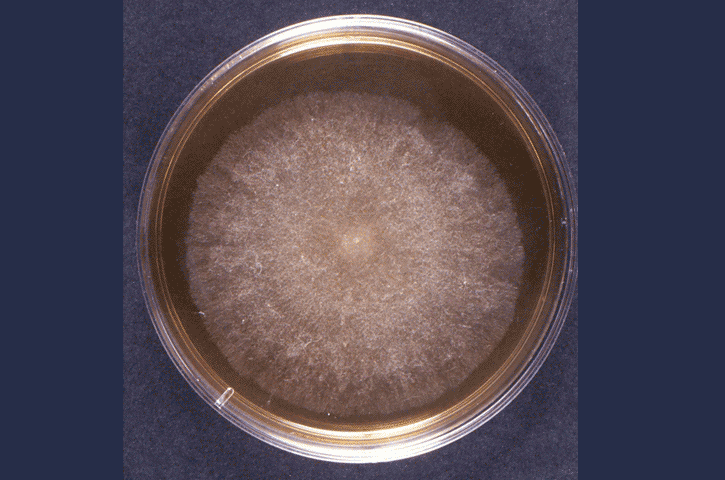 Yeast colonies are very similar to bacterial colonies. Moulds often have fuzzy edges. They usually turn into a different colour, from the centre outwards. Algae can be observed using unstained wet mounts. This gives an overview of algae. Observing bacteria in a Petri dish. Protozoa can be observed using unstained wet mounts. The following website gives an overview of some of the commonly found freshwater protozoa.